Today the Mr. worked a half-day so he could take all 3 of his girls out to lunch. We were using a gift card to Applebee's, which has a silly story attached to it that maybe is only funny if you were actually there. We shuffled into the car, made it a few blocks down the road & then realized we forgot the gift card. So we turned around & came back home. I ran inside, grabbed it from the Mr's cupboard in the kitchen, (Yes, he has a cupboard. ), & then we scooted on back toward the restaurant. As we pulled into a parking spot, I glanced back at the girls in the backseat & realized that Pazely was not wearing shoes. Well, she was wearing shoes, but not anything that I would deem acceptable for going out in public. Pazely was wearing thick sporty socks & clunky vintage tap shoes that were WAY too small for her. 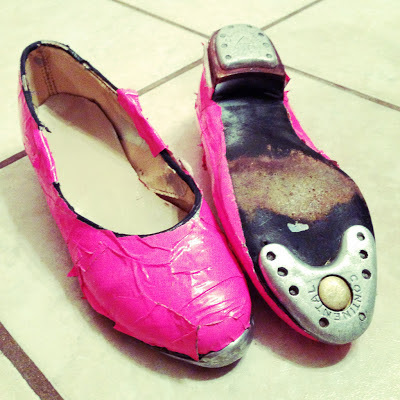 Tap shoes that she had lovingly covered in bright hot pink duct tape. So, not only was she loud, she was loud. When she saw the way the Mr. & I were looking at her, she replied, "What?! I like these shoes!" Oh brother. The Mr. threw his hands up in the air & seriously considered going back home for good. Thankfully we were seated at a corner booth, where her feet could hide under the darkness of the table. After our lunch date, we were headed to grab a few groceries from Walmart. I breathed a soft sigh of relief. She would be united with her people. Although the Mr. murmured something about Pazely having to walk 10 paces behind him, he ended up holding her hand as she TAP-TAP-TAPPED along the aisles in the store. As normal-tennis-shoe-wearing Zoey & I went to grab grocery-type items, the Mr. accompanied Pazely to the toy section so she could pick out a Christmas gift for her sister with her allowance. I couldn't help but giggle at that 6' 4" man & his tiny crazy-footed sidekick. But, man, if I were him I would've given her a piggy back ride or something. There was a terrible racket coming from the soles of her shoes. I was just grateful to be going in the opposite direction. I am convinced part of my children's responsibility here on earth is to make me humble/embarrass the crap-o-la out of their dad & I.
Tonight their mission was a success. And the tap shoes may, or may not, have "mysteriously" disappeared. Don't take away her shoes! They are great memories and later you can embarrass her when she has a serious boyfriend by showing photos and/or telling stories. :) My kids have done tons of things in public that just mortify me, but their kids! Oh, her shoes are still here! She makes me laugh every time she wears them. I love your post. I love the picture. I love that you relented and let your child out in public like that. My almost 9 year old has an obsession with cowboy boots. While it is embarrassing to see the choice of outfits she has put the boots with it never ceases to make me smile (at least on the inside). We have met some very nice people out when she is wearing any one of those pairs of crazy boots.